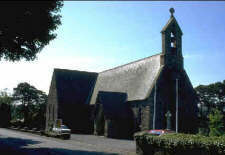 Parish is dedicated to St Runius or Ronan (Ma-Ronan) and is the only landlocked parish on the Island. It is thought that originally Marown and Santan were a single parish but the division had occurred by the 14th Century. The church was extended westwards by about 5m in 1750-55; a record of 1798 states that the much earlier, moulded jamb-stones were removed from St Trinians. About the same time a western gallery was added (the stone steps are still visible) to house musicians (violins and flutes). Like the doorway below the entrance to the gallery is flanked by massive masonry derived from an earlier site. When the new church was built the old church was used as a mortuary chapel; part of the east end was demolished and a door constructed. With the improvement of the Douglas/Peel main road in the early 19th Century population growth focused on Crosby and the old church became too small and too far from the congregation. In 1844 Phillip Killey, owner of a brewery in Douglas, gave land from his estate adjoining the main road between Crosby and Glenvine for a new Church. Tynwald approved the scheme in 1847, the foundation stone was laid by Bishop Auckland in 1849 and the Church consecrated in 1859. Ewan Christian was the architect - the 'scissor' vaulting is unique on the Island. His design is a standard cruciform shape with a bellcote and north porch built from slate with granite dressings. The interior is plastered with six lancet windows in the nave, two at the west end and three stepped lancets at the east end. A new vestry was added in 1899, the church reroofed in 1958, the pipe organ from the demolished St Barnabas installed in 1959 and the south transept has been recently converted into a meeting room. Ruined roofless chapel; current building is a 14th century enlargement of an earlier 12th century chapel. This chapel belonged to the Priory of St. Ninian Whitehorn in Galloway - was never a parish church but only a chantry. It was in ruins by the 17th century and forms the subject of several tales.